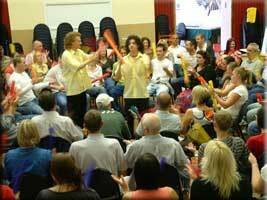 Whether you are looking for a conference energiser, putting together a school workshop programme or sounding out ideas for a community group, we can rhythmologise your people. We always consider your intentions for the day and discuss the various options with you to make sure that we deliver the best solution. Through working with numerous clients in many and varied situations we know what generally works best. Our experience has also made us adaptable so if you have something special in mind you can test our inventiveness! All our activities make noise and some are louder than others, so you need to consider the best location. A large non-echoing room is preferable - a conference room is ideal whereas a room with only hard surfaces such as a sports hall should only be used as a last resort. Activities in adjacent rooms also need to be considered. Drummers cannot easily express their rhythmical spirit if they are competing with a DJ playing amplified music and conversely a hundred drummers having fun would disturb a quiet lecture. Chairs on a level floor are required for the Drumming Workshop and Drum Circle although other activities can be done standing, in theatre seating or seated on the floor if necessary. Below are our most frequently used rhythm activity options. When you have read these and want to find out what previous clients think about our rhythm activities please visit our Feedback page. Great as a stimulating conference opener or a fun closing. No set up or clearing time required because the delegates are the instruments! Any number of people can take part using rhythmical vocal sounds and body percussion (hand clapping, thigh slaps, foot tapping etc). In fifteen minutes the facilitator will have the group wide awake, energised and ready to pay attention to the programme – and at the end of the day the same activity will see the delegates leaving refreshed and in high spirits. Of course it can also be used sneakily during the day, especially to revive attention for afternoon presentations. Similar exciting activity to the vocals and body percussion but using Boomwhacker tuned percussion tubes for a more musical effect. A few extra minutes are needed to hand out the tubes and then to collect them at the end. Suitable for large numbers and not as loud as drums. We do sometimes stick a conference message on each tube for you so that the delegates can keep them as a memento and they then have them to use at other times during the day. One tube is no good on its own, so this is a good way to encourage groups to get together and generate rhythms during breaks – unobtrusive team building. This activity can be a precursor to one or more Boomwhacker Workshops and Massed Boomwhackers. 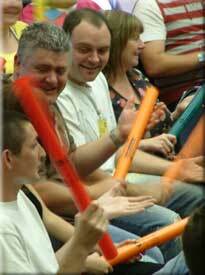 Click here to view our Boomwhacker Energiser Video and see how it could be applied to your conference or away day. Fun based activity that allows everyone, regardless of musical ability, to play together with a mixture of hand drums, bass drums with beaters, frame drums with beaters and hand held percussion items – bells, shakers, wood blocks etc. Vibrant excitement that gets everyone involved in achieving a success for the group no matter whether it is slow and intense or loud and frantic - as it is all guided by the facilitator. 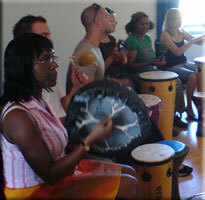 The players are encouraged to express their own sense of rhythm and when necessary the facilitator uses sculpting and conducting techniques to develop listening skills and co-operation within the group. Suitable for all ages and abilities and in almost any situation from approximately 15 people upwards to as many as the room and your budget will allow. People learn about themselves and their interaction with others whilst having a great time. Use a drumcircle as part of a team building day, as a learning opportunity when you have limited time and too many for a Drumming Workshop, or simply to have fun – it is wonderful for a celebration. Using hand drums with a group of up to about 30, participants learn the basics of playing a hand drum and then move on to explore building and playing rhythms together. 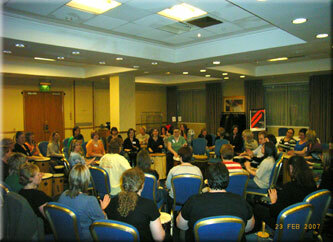 The simple exercises are easy and the group learn to work together while they have fun finding out how to drum. The facilitator guides the process and everyone gets a confidence boosting chance to play a short burst of rhythm and have it echoed back by the whole group. The workshop is approximately one hour in length and can be one of a series of break out sessions at a corporate event prior to a Drum Circle with everyone, it can be repeated several times with different classes at a school or is suitable for a structured evening at a youth or community group. 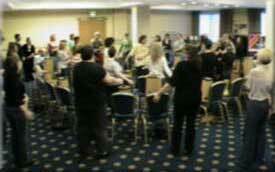 Depending on the client group, the workshop often begins with some Brain Gym style body percussion. Groups of 20 to 40 learn how to create rhythms using Boomwhacker percussion tubes in fun exercises that ensure co-operation. Participants practice how to facilitate rhythm generation and can then use their techniques with a larger group for Massed Boomwhackers later in the day. Team building and leadership skills are developed while the participants are having fun. 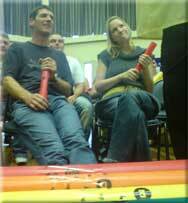 Everyone in the room, including staff, all play brightly coloured Boomwhacker percussion tubes. Quieter than drums so hundreds can play at once, from simple rumble games to layered rhythms – all lead by the facilitator or by people trained in a Boomwhacker Workshop earlier in the day. Can vary in length, although 30 minutes is reasonable for this high energy fun activity. With a small group we can run a workshop where everyone makes their own frame drum using durable low cost materials. You can see these black frame drums in use in our Drumming Workshop Video - they are light in weight and sound great. Vocals - almost everyone can use their voice to make sound patterns that vary from low chanting through controlled notes to blowing raspberries and in a large group the effect can be powerful and moving. Body Percussion - clapping, stamping, slapping… your own rhythm section wherever you go. Junk Percussion - creative use of everyday objects and materials to make economical and great sounding instruments…. plastic barrels or large oil drums for bass drums, water cooler bottles for hand drums, sections of pipe for chimes, small plastic bottles with filling for shakers, lots of things from builders merchants or hardware shops for all kinds of sounds. Active Rhythmology run workshops making lightweight frame drums (bodrhans or native American style drums) from building materials that sound great, are weatherproof and durable. 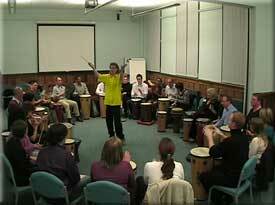 Hand Drums - most hand drums are suitable for use in a drum circle e.g. djembe, timbal, conga, darabuka, bongo, dumbeck, ashiko. Bass Drums - large drums played with a beater such as African djun djun or Brazilian surdo help to hold the rhythm together. Frame Drums - many sizes and styles, played with hands or a beater, lightweight and good for those with limited strength. Boomwhackers - brightly coloured plastic tubes tuned to one note per colour, quieter than drums and therefore good for large gatherings. Percussion - small hand held percussion instruments such as shakers, bells, scrapers, wood blocks and numerous novelty items. 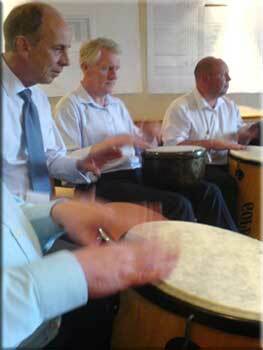 When you book a drumcircle or rhythm event with Active Rhythmology you will be advised on the best instruments for your activity. Normally we supply all instruments necessary.